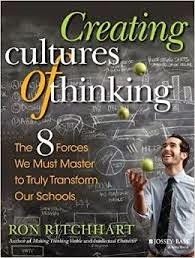 I read a great new book by Ron Ritchhart, Creating Cultures of Thinking: The 8 Forces We Must Master to Truly Transform Our Schools. The price of the book is worth it for the introduction alone: Demystifying Group and Organizational Culture. Have you ever been part of a group – a book club, a committee, a travel tour, a graduate course, a club, or a classroom? Then this book is for you. Do you have an experience of being in a culture of thinking in mind? Upon reflection, do you remember having a sense of purpose to the learning? Do you remember having a commitment to the task at hand? Was there a feeling of equity within the group? Was there a sense of engagement and an element of challenge? In recalling a time when you were part of a dynamic group of people learning and creating together, do you have a feeling of connection: connection to the task at hand, to the topic, to the learning, and to the group? Like I said, the introduction is amazing! My favorite big question in the book was: “What do you want the children you teach to be like as adults?” How would you respond to this question? … and the list goes on. Include your own and you’ll notice that there are few traditional, measurable, testable skills mentioned. This is an awesome book and should be read by teachers and administrators… or anyone interested in the tools needed for unlocking, understanding, and shaping powerful learning environments that get the best out of people.